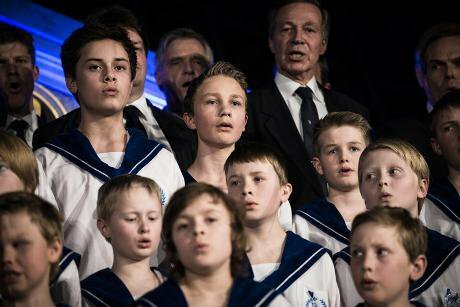 It's their future: a choir performs at Oslo City Hall during the conference on the humanitarian impact of nuclear weapons organised by the Norwegian government in 2013. Demotix / Alexander Widding. All rights reserved. After four weeks of statements, deliberations and often bruising negotiations at the UN headquarters, the states party to the Nuclear Non-Proliferation Treaty (NPT) could not agree a plan for nuclear disarmament and non-proliferation to guide their work over the next five years. The draft outcome was blocked on 22 May by the United States, with cover from Canada and the UK. The US blamed an “unrealistic and unworkable” demand from Egypt to set a deadline for the convening of a conference on a zone in the Middle East free of weapons of mass destruction—a conference the last NPT review in 2010 had stipulated must take place by 2012. By the end of the conference, what would have been the disarmament section of the outcome document was unacceptably weak. Its adoption would have dealt another blow to the credibility of the NPT as a vehicle for nuclear-disarmament efforts. The draft contained no meaningful commitments by the nuclear-armed states and their allies. It set out few clear activities and no deadlines. Indeed, in many areas it rolled back on disarmament promises made in 2010—such as diminishing the role of nuclear weapons in security doctrines, excised from the draft. It also suggested that work on nuclear disarmament at the UN General Assembly be done by consensus, even though that forum has always operated through democratic voting procedures. Overall, the draft strongly reflected the priorities of the NPT’s five officially nuclear-armed states and their nuclear allies, in favour of upholding a status quo which features little activity on disarmament on the one hand and the modernisation of nuclear arsenals on the other. The conference president had said the NPT belonged equally to all its members but, amid a lack of consultation, backroom deals rather than negotiation and bullying behind closed doors at late-night sessions, it was no surprise the result did not reflect the concerns of most states. Indeed, some asserted that the draft, in particular the disarmament section, did not represent a negotiated document at all. A wider analysis of multilateral fora discussing nuclear disarmament shows that lower-income countries are less likely than richer ones to send representatives and, if they do, field smaller delegations who are less likely to speak. Many are in nuclear-weapons-free zones, whereas significant high-income countries are part of a nuclear alliance, which shows how the debate is skewed. Some states expressed their frustration and sense of injustice at these dynamics in New York: South Africa compared the “sense that the NPT has degenerated into minority rule” to the conditions of apartheid. If it has not already become the case, the NPT is in danger of being perceived as a vehicle for the interests of nuclear-armed states, who are not seen to be upholding their end of the treaty’s disarmament/non-proliferation bargain (they negotiate in good faith for disarmament; others do not join the nuclear club)—another instance of the failing global stewardship of the five permanent members of the Security Council. Though the draft disarmament plan would have lacked impact and credibility if adopted, recent analysis has suggested that the reduction of stockpiles of nuclear weapons by NPT nuclear-armed states is entirely unaffected by whether an NPT review has any outcome. Against this background, it is clear something new is urgently needed. In fact, a new initiative is under way. At the 2010 NPT conference, parties expressed concern at the catastrophic humanitarian consequences of any use of nuclear weapons. Since then, momentum has been building around a humanitarian-focused reframing of the issue. This concentrates on the weapons themselves and their unacceptable impact on human beings and the environment, rather than on claims about their strategic and security functions. Unlike the other weapons of mass destruction, there is no comprehensive, explicit prohibition on the possession, production, transfer and use of nuclear weapons. At conferences hosted by Norway, Mexico and Austria, and within the academic and NGO communities, new evidence has been presented, with survivors of nuclear explosions providing powerful and crucial testimony. Increased concern from the great majority of states worldwide has been seen in forums including the NPT, where this year 159 states signed a joint statement on the humanitarian impact of nuclear weapons. This led to the one substantive outcome of four weeks of discussion in New York. At the conclusion of the NPT review conference, 107 countries had endorsed the Humanitarian Pledge, which commits them to take action to “fill the legal gap for the prohibition and elimination of nuclear weapons”. It features a commitment to join other states, international organisations, the International Committee of the Red Cross and civil society in efforts to “stigmatise, prohibit and eliminate” nuclear weapons, based on their unacceptable humanitarian consequences. Though it refers to the need for new legal measures to support NPT obligations to develop effective measures on disarmament, its implications go beyond the treaty. Unlike the other weapons of mass destruction, there is no comprehensive, explicit prohibition on the possession, production, transfer and use of nuclear weapons. This is the most immediate ‘legal gap’ which needs filling, through a treaty banning nuclear weapons. This would be a logical next step from the humanitarian initiative and would represent an effective measure towards nuclear disarmament. Even if the nuclear-armed states did not initially join, it would represent a clear normative assertion that nuclear weapons are inherently unacceptable and would have practical impacts, such as on the financing of nuclear-weapons modernisation. Unlike the NPT, where different roles are assigned to the nuclear-armed states and those without such weapons, it would not discriminate between states in their obligations. To many states the humanitarian initiative has represented the coming of democracy to nuclear disarmament and a recognition of the priorities of the vast majority, which do not have nuclear weapons—Costa Rica expressed this strongly at the NPT review. It also threatens the hold of the nuclear-armed states over the agenda, suggesting that the object of urgent concern should be nuclear weapons’ human impact rather than the nuclear-armed states’ security theories. The nuclear-armed NPT states thus engaged in desperate efforts to remove any reference to humanitarian consequences from the draft outcome. France even attempted to deny that any new evidence on the humanitarian impact of nuclear weapons had emerged or that there was any risk posed by their own nuclear weapons. The 107 backers of the pledge must now take the momentum of the humanitarian initiative forward. The negotiation of any new legal instrument should be open to all states but unamenable to being blocked by any one. Consensus rules in multilateral forums do not necessarily ensure open inclusion: they can instead perpetuate the dominance of a small number of states on matters of pressing global concern. This August marks the 70th anniversary of the atomic bombings of Hiroshima and Nagasaki. It is time for negotiations on a treaty banning such weapons to begin in earnest.